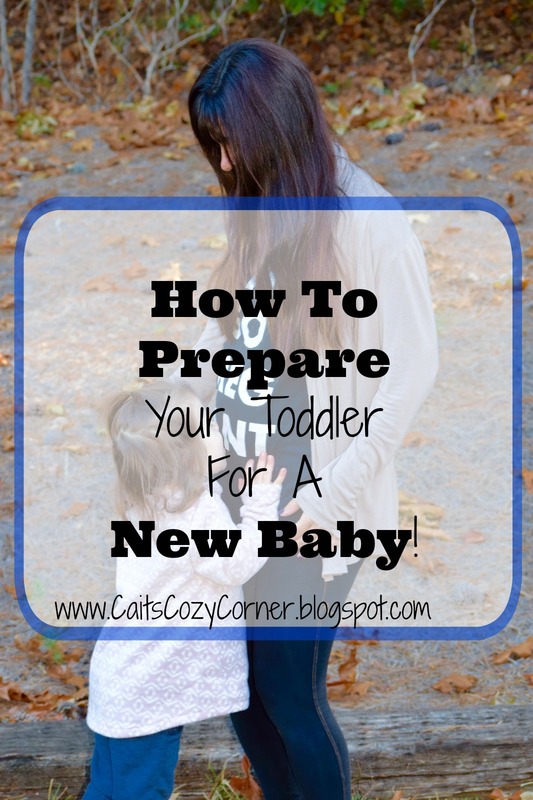 Cait's Cozy Corner : How To Prepare Your Toddler For A New Baby! How To Prepare Your Toddler For A New Baby! When we found out last August we were expecting another little miracle. Zach and I were so excited! We couldn't wait to get into that baby mode again ( the crying, up all night and zombie feel... right)? We also couldn't wait to see how our toddler would react to the news. While Lily has had us all to herself for almost the last three years I knew she may have some difficult moments ahead when not being able to get our full attention. As a typical toddler, Lily loves routine. She knows that her Dad usually gets her up in the morning, dresses for school and drops her off at daycare. I'm the one that puts her to bed at night, brushes her teeth and gives her a bath. While this routine has been great for everyone, I began realizing that in a mere 4 months, I won't be able to do this nightly routine because of either nursing, pumping or getting a nap in ( for those awesome night time feedings! ) and asked Zach to take her up. Well you would have thought the world was ending! I've never seen someone scream, cry and beg for their Mommy and she hated the change. It honestly broke my heart hearing her as he carried her upstairs and attempted to calm her down. In light of all of it, I wanted to share some tips I thought of to help transition your little one before a new baby comes. Hopefully these can help you and your little! 1. Talk With Them- This may sound silly but just talking to your child about your pregnancy is key to keep them aware of the changes that are happening. I usually point to my stomach and say "Your brother is in Mommy's tummy" to which Lily sometimes will want to touch or rub or wave to the baby. She understands that baby brother is growing. 2. Make Them Feel Involved - By sharing things that the new baby will be doing, it shares that you want their help with certain tasks. Lily has been helping putting bottles away, feeding her doll to know that the baby needs milk and also to sleep. 3. Read- One of my favorite books to read to Lily is "I'm Going To Be A Big Sister" ( they also have this one for big brothers PLUS this was a favorite of mine growing up). and she adores learning of the new baby that will be coming into our life and how she can visualize being there. 4. Encourage Toddler to Pick Something Out - Lily loves helping to find things for other people. I can always see a huge light in her eyes when she makes someone else smile. Many friends and family members have said that allowing your child to bring a gift and wrap it ( with help if needed ) for their new sibling is enjoyable. 5. Use Calm Words - Do help prepare your toddler for their new sibling, start by encouraging using 'calm words'. Instead of saying " Don't hurt the baby! " say something along the lines of " Let's use our soft hands to hold the babies hand. " or "BE NICE!" say "Let's use our indoor and calm voice to talk to the baby". I've already started incorporating "Using our calm voice" to help her become adjusted to that which has really helped! What tips do you have for preparing for a new baby?